The Botulin Neurotoxin (Botox) was discovered in 1815 and has been used for numerous purposes in medicine amongst others for neuromuscular diseases and the treatment of wrinkles in facial aesthetics for the last 20 years. It inhibits the release of acetylcholine from presynaptic neurons of striated muscle, causing paralysis. BT is formed by an anaerobic gram-positive, spore forming bacteria called Clostridium Botulinum. In South Africa, type A, Botox is the only available product. It is measured in mouse units (MU), which means the number of units that would kill 50% of the mice injected with it. The common areas of use for the treatment of facial wrinkles are the glabellar frown lines, crow’s feet and horizontal forehead lines. It can be used for downturned mouth corners, an accentuated jawline and a smoother neck ‘the Nefertiti lift’. Injection related side effects are swelling, bruising and numbness and are all of a minor, transient nature and resolve spontaneously within 2 weeks. Allergy is extremely rare. 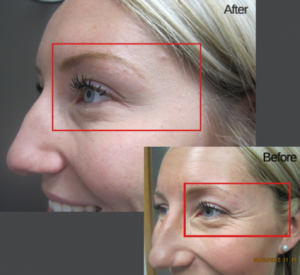 The benefit of Botox is that the effect is reversible and side effects are rare and of a mild nature if they do occur. Botox treatment results in reduced facial wrinkles compared to placebos. The peak effect is around one month but the effects last between 4-6 months.